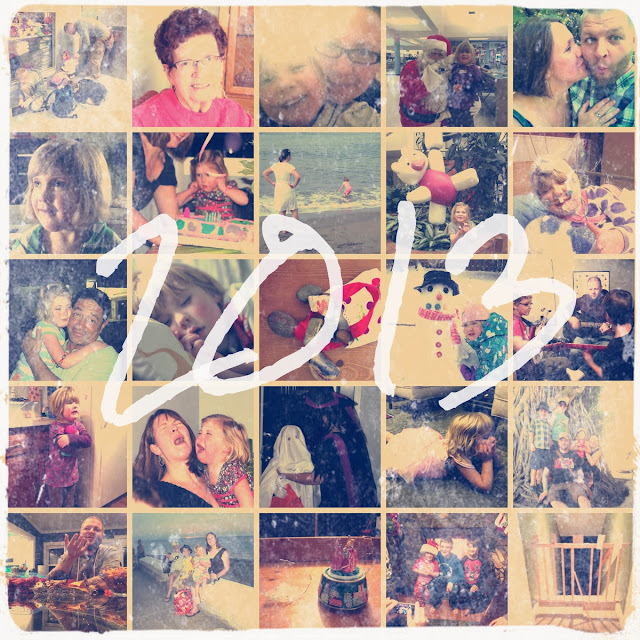 Goodbye 2013. I won't be especially sad to see you go. Not that you've been terrible to me. My husband kept his job. We have a warm, cozy house. I got my ensuite back this year, after a year of being without. I missed it. But I still can't use the shower, 2013, because we're waiting for a part. So, as you may understand, I'm not exactly jumping up and down. And we did take Finleigh on her first plane ride in years and she didn't cry the whole time like she did last time, which opens up our world just a little bit. So there's that. Thanks for that. But, my beloved grandma died this year. My last grandparent. The whole generation of my family, now gone. Reminding me of my age. Reminding me of my parents' age. And leaving me with a big hole in my heart because my grandma was a special gem. I'm grateful that she didn't suffer or experience the indignities that can come with aging, but I miss her. And I lived a million miles away and barely saw her. Imagine the hole for those who had the joy of living close to her? Never again will I see her phone number on my phone and answer with a smile on my face and hear her voice, "Hi Mandie. "And then it would be a contest for me to see how long I could keep her on the phone because she didn't want to disturb me because she knew I was busy. So no… 2013… I won't miss you for that. But mostly? Mostly, I am glad to see you go because 2013 is the year of Smith-Magenis Syndrome for us. And yes… I know it's not your fault. SMS happened in 2006 when Finleigh was conceived. But, 2013, you get to be the scapegoat because this is the year that we found out about it. And it closed up our future in so many ways. And it explained… everything. And then I sunk into a deep, black cave for several months. I may have smiled on the outside, but there were always tears behind my eyes. And yes, since we learned about SMS, we have been introduced to an amazing family of others with the same syndrome. And I love them. And they, in many ways, are my new rock and strength because they understand the insanity that we live with. And they live it too. And did I mention that I love them? Not as much as my blood family and my in-law family, who have also been so good to us… but it's a close second. And yes, since we learned about SMS, we have gotten Finleigh on acebutolol, which is helping with bedtime. Sort of. So that's good. And yes, since we learned about SMS, I have grown a backbone and I got a little bitchy and got us respite time. And actual real help with a real doctor for her behaviour (results still to come). And we have an answer to all our questions. Well, not all, but many. But still, 2013, you were hard. Very, very hard. It took me 9 months to finish my classes that should have taken 4. I gained 25 pounds. TWENTY FIVE. I can't even tell you how much I hate that. Jumping up so close to where I was when I first started this blog so many years ago. Do you know, 2013, how much work it was - and is going to be - to get this damned weight off? Do you have any clue? And there are a few other things, 2013, that are weighing on my mind, that I can't talk about here because of people's privacy… but you know what they are 2013. And I'm not happy with you. And cancer makes me mad. So… there. So, 2013, thanks for the good times. Because there were good times. Really, really good times. But goodbye. I won't miss you. Yes. 2013. You may go now! Love you, Amanda. ya. So long 2013... don't let the door hit you on the way out. pfft.